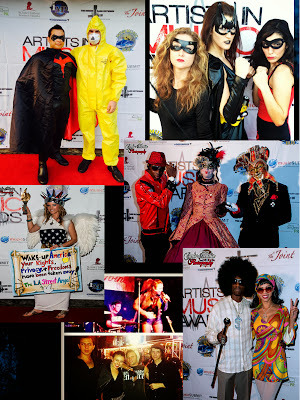 First of all, thank you to everyone that made it to our Halloween Costume & Red Carpet Event. This was the best turn out we had all year and probably the most fun, because we got to dress up. Congratulations to the mystery couple that took home the prize for Best Costume. We still have no idea who they were, but I’m happy the couple showed up in the spirit of Halloween and stayed for the entire show. A BIG THANK YOU goes out to Melanie Taylor, Cheating Daylight, Y LUV, Torrey Mercer, Chelsea Perkins, and Lora McHugh. I was very proud of this line up as they put on an incredible performance! A special Lifetime Achievement Award Presentation to Michelle Phillips & Humanitarian of the Year Award to David Harrison Levi will be presented by Mikey Jayy himself. November 1 at Midnight PST is the final day to enter the 2014 Artists In Music Awards! 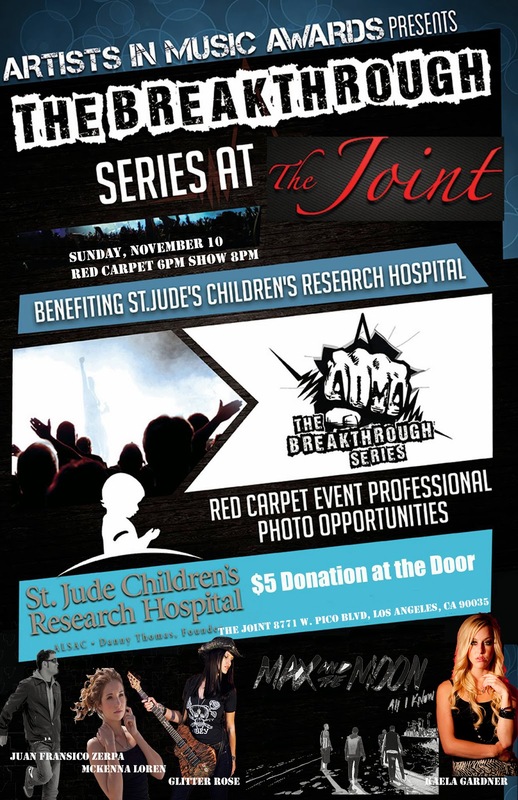 Where: The Joint in Hollywood, CA at 6pm. 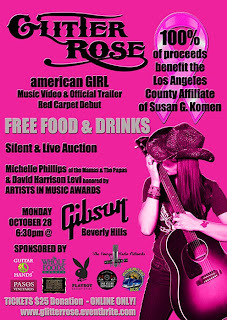 Hills benefiting Susan G Komen for Breast Cancer Awareness Month hosted by Glitter Rose . This is an exclusive place, so no one can just walk in the Gibson showroom without an appointment. I will be making a rare appearance on stage and handing the Lifetime Achievement Award to Rock N Roll Hall of Fame Inductee, Michelle Phillips and I will be giving the Humanitarian of the Year award to David Harrison Levi﻿ for his dedication to Breast Cancer Awareness. This is only open to the first 100 people! CLICK HERE TO GET TICKETS 100% of proceeds goes to Susan G Komen. 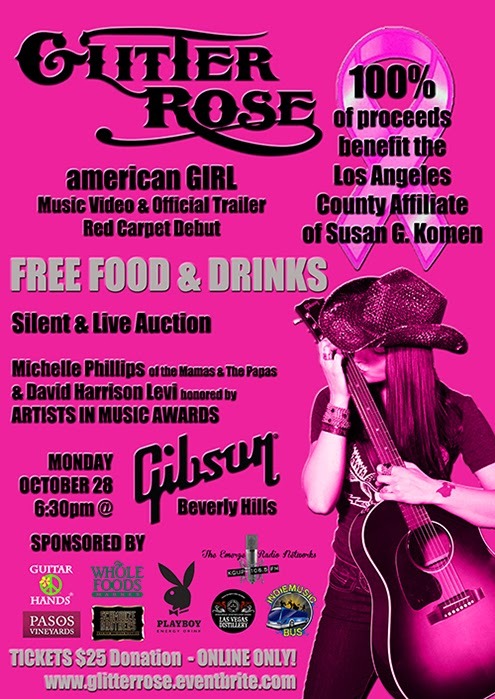 FREE FOOD & DRINKS are provided, plus you'll get a live show by Gibson Artist and 2-time AIMA winner Glitter Rose﻿!